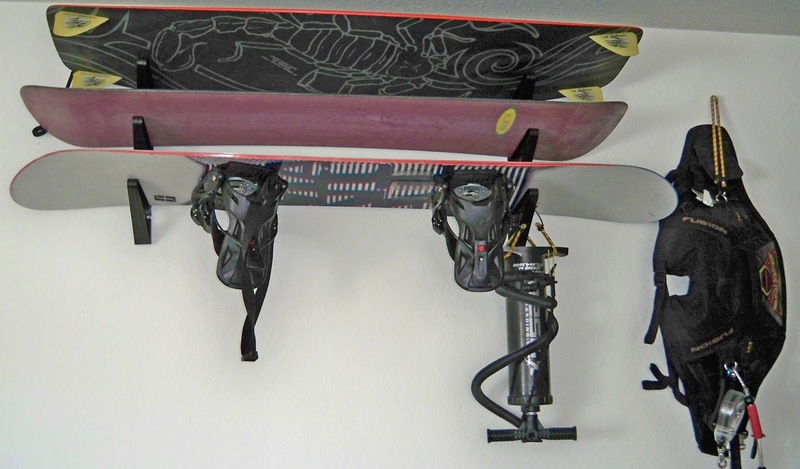 Check out this awesome pic from Sergio in Los Angeles, California putting the StoreYourBoard Board Rack to use with two snowboards and a kiteboard. Very nice Sergio, thanks for sending this one in! One of the best parts of the StoreYourBoard Board Rack is its multi-use potential. I know most of you probably ride more than one board during the year; if you love to snowboard you probably trade that in the summer for wakeboarding, kiteboarding, or surfing, and pretty much everyone has a skateboard. With the StoreYourBoard Board Rack you can store them all in one place. The other cool thing you can see here is Sergio is hanging his kite pump from the holes in the rack arms. This is a great use of space and a way to store even more of your sports gear using this rack. Use a clip or a bungee cord to store all your accessories. We love to see your photos! Send them in to andrew@storeyourboard.com.